Where do you see yourself in five years' timeIts survey of 8,600 members found most of those leaving blamed "huge workloads and excessive accountability".Education Secretary Damian Hinds has promised to tackle the workload issue.One teacher, who responded to the union's State of Education survey published at its annual conference in Liverpool, said: "Working 70 hours a week for many years has meant my health and family life have suffered. Another unnamed respondent said: "My job is no longer about children. It's about a 60-hour week with pressure to push children's data through. "More than half of respondents said their work-life balance had got worse in the past year, with one teacher saying: "With a young family, and despite working part-time, I have come to realise that a job in education is not conducive to family life." Another said: "My personal life doesn't exist any more. "And the outlook was negative for a substantial minority of new teachers, with some 26% of those who had been in the job between two and five years, saying that they plan to quit the classroom altogether in five years' time. NEU joint general secretary Kevin Courtney said: "The government is doing a far better job of driving teachers out of the profession than they are solving the issue of excessive workload. "He said that the main problem was one of excessive accountability, adding: "So long as the main drivers of a performance-based system are still in place, schools will continue to be in the grip of fear, over-regulation and a lack of trust. 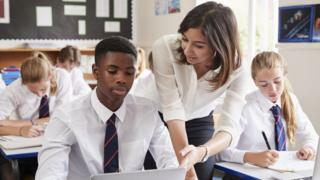 "Mr Hinds has acknowledged that long hours and red tape are among the "biggest threats" to recruiting and retaining staff.A spokesperson for the Department for Education said reducing teacher workload was a key part of its retention and recruitment strategy. "We have worked with school leaders and teachers to create a workload reduction toolkit, which provides practical advice and resources that schools can use rather than creating new ones from scratch," he added. "We are also tackling excessive data burdens in schools; simplifying the accountability system to target the associated burdens and working with Ofsted to ensure staff workload is considered as part of a school's inspection judgement. "Recruitment targets for teachers have been missed in England for five years in a row.